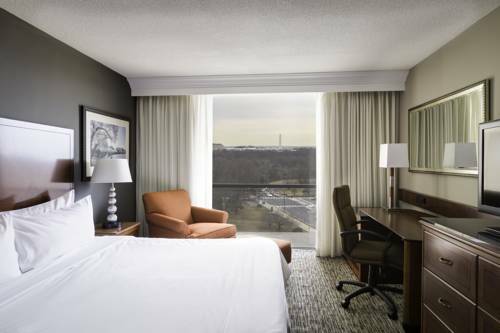 Explore Washington, DC from one of the most conveniently-located hotels in Arlington, VA, Key Bridge Marriott. Located across the river from Georgetown via a pedestrian friendly bridge, our hotel offers access to the Nation's Capital, as well as many vibrant Northern Virginia neighborhoods. Well-appointed guest rooms and suites boast perks for the modern traveler with plug-in technology panels, high-speed Internet and ergonomic work space. Host unforgettable weddings and events at our hotel with venues like the top-floor Capital View Ballroom, which provides amazing views of Washington, DC. Guests will enjoy free Wi-Fi in the lobby, a business center and mobile check-in and check-out to simplify their stay. If you're here to explore the city, our hotel is perfectly located right off of RT 66 and George Washington Memorial Parkway. Whether youre visiting for work or pleasure, our location just across the bridge makes it easy to get from here to there and is only three blocks from the Rosslyn Metro. This casual hotel restaurant near Georgetown features classic dishes and comfort food with a modern interpretation. Flat-panel HD TVs, complimentary wireless Internet access and an eclectic menu make Connexion a top choice among restaurants near Georgetown. This casual dining option lets you stay connected during a working lunch and relax during dinner with friends. - Union Station - Washington D.C.